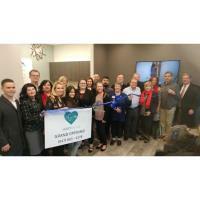 The Barrington Area Chamber of Commerce and the Village of Barrington gathered for a ribbon cutting on Tuesday, January 8 to celebrate the grand opening of Hart Dental, 728 W. Northwest Hwy. in The Foundry of Barrington. Hart Dental specializes in cosmetic and restorative dentistry, and offers limited orthodontics, botox, TMJ/facial pain specialty, and sleep apnea treatment. “Whether you’re seeking a gentle, friendly dentist to provide routine checkups or hoping to achieve the smile you’ve always wanted, we are here to meet your needs and provide excellent dental care,” said Dr. Agnieszka Iwaszczyszyn. Ribbon cutting attendees included (l-r): Ted Werle (Apex Design and Build), Karen Darch (Village of Barrington), Przemyslaw Iwaszczyszyn (Hart Dental), Parthena Bouikidis and Dr. Iwona Iwaszczyszyn DDS (Hart Dental), Peggy Blanchard (Village of Barrington), Yanira Gallegos and Dr. Aggie Iwaszczyszyn (Hart Dental), Martha Goodman Stack (Wells Fargo Advisors), John Bouikidis and Michelle Hartung (Hart Dental), Michael Schultz (IT from FireLogic), Gaye Mack (Gaye F. Mack, Inc.), Dennis Kelly (FGMK Insurance Agency, Inc.), Norman May (Full Service Office Solutions, Inc.), Jeff Lawler (Village of Barrington), Charlotte Neault (Barrington Bank & Trust Co., N.A. ), Lisa Mergens (Ascendant Dental Development), Enrique Vasquez (CareBuilders at Home) and Alan Wiscomb (Daily Herald Media Group).